Ms Archana Dixit graduated from India in 1993 and began her career in Obstetrics and Gynaecology at the prestigious Lady Hardinge Medical College in New Delhi India where she completed her postgraduation (MD) in Obstetrics and Gynaecology in 1998. After working for a couple more years at the same institution, she worked in Muscat, Oman for 2 years in a socio-culturally diverse female population before moving to London. She trained in the Northwest Thames region of London primarily at the Chelsea and Westminster Hospital where she had the privilege of training with some of the eminent doctors in the field of Obstetrics and Gynaecology. She was awarded the Gold Medal in the 2001 examinations for the Membership of the Royal College of Obstetricians & Gynaecologists (MRCOG), UK. She has a broad and extensive clinical and surgical experience in the field of Obstetrics and Gynaecology and has obtained specialist skills training in the management of high risk pregnancies, medical disorders in pregnancy and leadership on the labour ward. She took up her substantive appointment at the West Middlesex University Hospital in 2008 where she is the lead for Endocrine disorders and HIV in pregnancy, Obstetric Audits and Postgraduate Teaching. 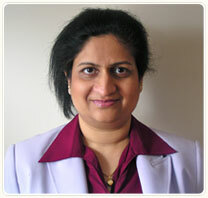 She is also an Honorary Senior Clinical Lecturer at the Imperial College, London.